Captain Lewis Dunk hailed Brighton & Hove Albion's character after the Seagulls reached the semi-finals of the FA Cup at Millwall this afternoon. 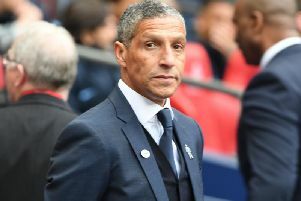 Albion trailed 2-0 with just two minutes to go but late goals from Jurgen Locadia and Solly March sent the game to extra-time. The match finished 2-2 and Albion then progressed 5-4 on penalties to reach the semi-finals for the FA Cup for just the second time in their history. Dunk said: "It's crazy, we did it the hard way by fighting back and it's an amazing day. "It shows what character we've got. We've done it over the last four or five years since the gaffer has been here and we never give up. "We knew what the prize was coming here and now we're going to Wembley. Hopefully we can go there, have a good day and get ourselves back in an FA Cup final." Dunk says Albion knew how tough the tie with Millwall would be and said: "It was always going to be a tough place to come. "We knew what to expect, a high-tempo game and we showed in the first ten to 15 minutes that we had to deal with it. "In the first half I thought we dealt with it well and it was disappointing to go 2-0 down and make it hard for ourselves but it showed what great character we've got in the team. "It showed in the last five minutes and then to win win on penalties. "All credit to the boys." Albion will now face Manchester City in the semi-finals over the weekend of April 6 and 7. City are in the hunt for the quadruple this season and Dunk said: "We'll prepare for it and work hard. It's a game of football, 11 men v 11 men on the pitch. Anything can happen."